Happy Sky Watch Friday everyone, I really appreciate the message of Sky Watching is that we all have opportunities to spot beautiful. skies, you just never know when a great view is going to pop up on the horizon. It is almost cane cutting season here, warm breezes scented like molasses, in between tropical showers. Click the link to see what other bloggers from all over have found in their view of the sky to share this week. It is a busy time of year and my crafting schedule is full of new adventures. 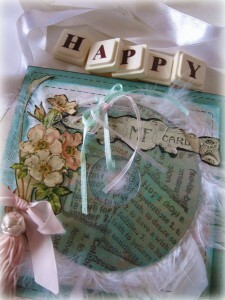 This is a sneak peek into a special Christmas present using some new products from Melissa Frances, Clearsnap and Westcott. Am really excited we can now order Melissa Frances papers on line. Cane cutting season, huh? Nothing like a (controlled) cane fire to make you feel Australian!! Have a great end of week!! i sense a feeling of calmness here. 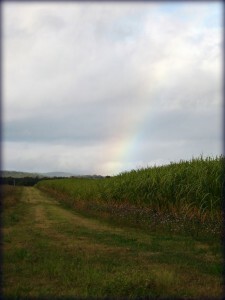 That is a very sweet rainbow, because it is on top of sugarcane! lovely. Did you find the pot of gold? A beautiful capture. Beautiful rainbow ! It&#39;s a long time ago I haven&#39;t seen one ! Lovely quote and a beautiful rainbow. I hope you have a wonderful weekend, happy skywatching! Looks like the path leads to the rainbow…or the other way around. Lovely. love the rainbow and the moody picture…thanks for visiting me, I have been a reader of blogs for a while… and I am back now. Lovely shot to go with that wonderful quote! Leave a Reply to Gerald (Hyde DP) Click here to cancel reply.